We’ve all had our experiments with wood, charcoal, and even gas when cooking outdoors, but did you know that charcoal was originally used for several other reasons including art, medicine, makeup, and metallurgy? Charcoal has been used as a pigment for ages to represent the color black. From the earliest paintings and inscriptions to modern art, charcoal is a favorite among a long lineage of expressionists and artists alike. Furthermore, charcoal is microscopically absorbant and can be used as a pigment for dyes used to create black and grey fabrics. Charcoal is one of a few age old home remedies for dietary and digestive issues. For centuries people of the ancient world all the way to today have used charcoal to settle stomach aches and other digestive issues. It is so popular that charcoal is still used today in pill form to address and treat ailments. Charcoal is a fairly clean burning fuel when compared to wood and other organic rich fuel sources. That’s because charcoal has been through a process called pyrolysis, which is like fire anaerobics for trees. 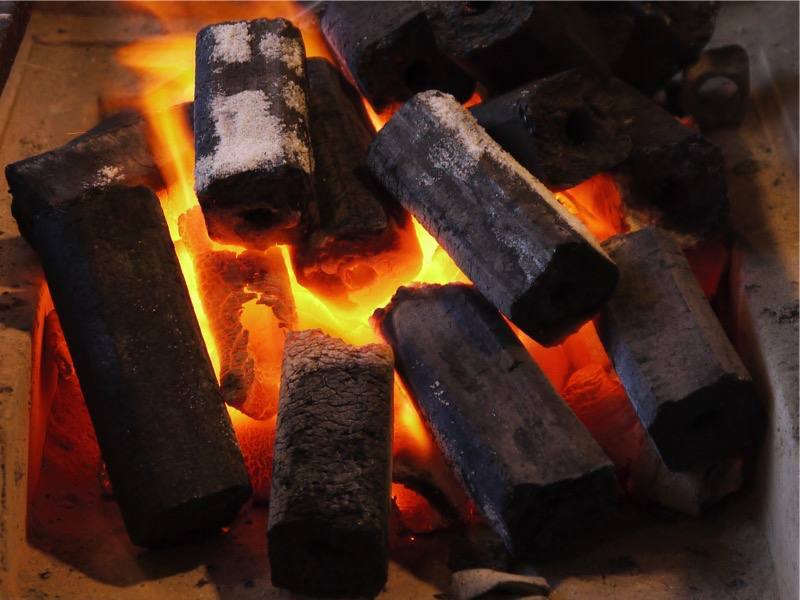 That means that wood or other vegetation like Bamboo, is heated to high temperatures with the absence of oxygen which consumes the organic matter and water and dries out the vegetation forming a charred black carbon substance we call charcoal. Since the wood has been burned once, the main byproduct, smoke, is cut in half leaving a combustible substance that puts out way less smoke. When you have less smoke, you can forge and weld metals with fewer impurities which allows for a better quality metal. 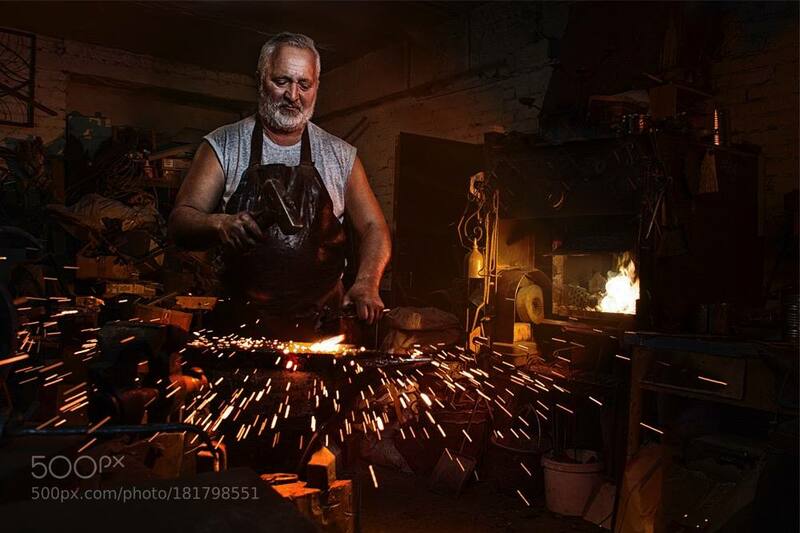 Charcoal has fueled blacksmith forges from the early beginnings of the bronze, iron, and industrial ages throughout today. Like the dyes and paints mentioned before, charcoal can be ground into a microscopic powder pigment and used in a wide variety cosmetic products because it is absorbed very well by the skin and has staying power. Maybe she’s born with it? Maybe it’s Royal Oak? Naturally charcoal is a fuel of choice for many barbecue enthusiasts, and it’s American as Ellsworth B. A. Zwoyer… Yep that’s right, charcoal as we know it in the briquet form was invented by Zwoyer in 1897 in Pennsylvania. So 6 years before the Wright Brothers were jumping off of sand dunes with a giant kite, Zwoyer was getting a patent on charcoal, literally one of the most abundant and widely used fuels in the world, because he made it into nice consistent square briquets. And you thought Steve Jobs was a visionary. LOL. This guy reinvented reburning wood and patented it. It doesn’t stop there though, Henry Ford got into the game and changed it FOREVER. Henry Ford needed a way to recycle and reuse wood byproducts and horsefeed used in his automobile factories so he took the charcoal briquet idea and ran with it. He began producing charcoal and selling it which founded a little company called Kingsford. So what does all this have to do with Jim Quessenberry BBQ? Well for one you won’t be seeing us using any of Hank Hill’s propane and propane accessories, but furthermore, we prefer to cook most everything with charcoal for a smooth, longlasting, and well controlled fire. I prefer Kingsford, but Royal Oak will do in a pinch. I suppose that makes me a Ford man afterall. Tell you what, why don’t you grab a bottle or two of the good stuff in our shop and share some of your charcoal grilling techniques with us. We’d love to hear your stories. First, get your fire started. I like to build a fire on one side of my grill to have a side for fast cooking and a side for slow cooking, or a holding area. I will share why later. I usually do my grate cleaning once the fire is lit and everything is warming up as the heat makes it easier to clean. Next, get a bowl or pan to put your meat into, and then take your meat (preferably 80/20 ground beef) and spread it out by separating it into smaller clumps. Season your meat by sprinkling salt and pepper on it and mixing it about. At this point many people will mix in a raw egg or breadcrumbs, you can do that if you like, but it is not necessary. The idea is to use the raw egg and/or breadcrumbs as a binder to help make the meat stay together, and the breadcrumbs also make the meat go a little further. What makes this burger so good is the secret ingredient I use when seasoning and patting them out. My secret ingredient is none other than Sauce Beautiful, I like to mix about 1/2 cup per pound. I mostly just eyeball it. You want the sauce to act as the binder you are looking for, but don’t use too much or the sauce will do just the opposite, and make the meat fall apart more easily. Then, roll up your meat into balls about the size of the palm of your hand. Then smash the balls into disc being careful not to let the discs split around the perimeter as the patty spread out. I like to make 1/2″ to 3/4″ patties. Some people like them thinner. When you get your burgers patted out take your thumb and indent each patty right in the center, this will help to prevent the patty trying to return back into a ball shape as it cooks. At this time, it should be about time to grill these awesome looking patties. you wanna put the burgers directly over the heat. Let the burger cook with a closed lid for about 5 mins per side for medium, and little longer for well done. If you have flare ups be sure to have some water handy to tame the fire. If you try to turn a burger and it is sticking to the grate, it probably hasn’t cooked on that side long enough. once the patties are firm and not falling apart, you can move them to the indirect heat, and add your favorite slice of cheese. I am a pepper jack fan myself. The burgers will continue to cook on the indirect side, and also the cheese will melt. Once the cheese is melted onto the patty the burger is ready to go onto a bun. I like to toast the buns and then take a burger patty fresh off the grill and place it on a bun. Serve with your preferred condiments, and enjoy! The burgers will be really great tasting and not dried out as the Sauce Beautiful also helps to retain the moisture as the burgers cook. I call it the Quessenburger! Day 6: Introducing A Revolutionary Method To Master Reverse Seared Pork Chops. Remember that time when we did that one recipe with a gas grill? Me either so that’s not the revolutionary method, but I’ll tell you what is; cold smoking that delicious hunk of pork that we call a pork chop and then sizzle it on both sides to create a delicious, mouth watering, morsel of delectable perfection. I’m bout to blow your mind. So there’s a few things to remember here. You’re gonna need an effective way to slow smoke or cold smoke the pork chops to an internal temp of say 130 degrees or thereabout. We’re going to use Jim Quessenberry’s Sauce Beautiful White and Hickory Rub so head over here and order those. Get some asparagus or some other kind of fancy veggies that you want to steam, smoke, or grill. Lemon Juice or fresh lemons and some butter. A hot flat iron skillet. So first things first, let’s get a nice indirect heat source, preferrably with charcoal or a fruit wood for added flavor and let it mellow out to some nice glowing coals. You don’t want to flame kiss the chops. This part is important for the preparation and flavor. Use a water pan or a divider if you have to but we’re seriously only looking for a smoke source with a little bit of heat. Next, while that is underway, make sure the pork chops aren’t some “bargain bin 5 for $25” pieces of thin boot leather. Get some 1/2” to 3/4” thick cuts. Don’t be a cheapskate. If you wanted pork jerky you could have gone to a gas station. Let these dudes rest up to room temperature. That will allow the meat to absorb the smoke better when you place them on the heat source. Now that you’ve let them rest and the fire has a nice glow, place them indirectly over the heat source and let them get some of that fruity goodness of those apple chips smoking. Do this for a few minutes until the inside temp of the chop is like 125-130 or so and then remove them and let them rest once more. While they are resting, stoke up your fire to a really hot temp and put your trusty ole flat skillet directly over the heat to get damn near red hot. While that’s in progress, dash some Hickory Rub on all sides of the chops while glazing them with a little bit of butter. Let that sit for a minute or two. Once the surface of the hot plate or iron skillet is extremely hot, drop the chops on it and let them sear for up to 2 minutes on each side. This will tap all the juices in and crust up the seasoning on each side for a flavorful bark. Remove them and place in a warmer or indirect heat chamber while the veggies are being done. For the veggies, a buttery grilled medley of asparagus, brocolli, cauliflower, and red cabbage will make a savory dish worthy of a five star restaurant. If you are wanting a contrast with a more natural flavor from each vegetable, simply opt for a steamed version of the medley. Top with some cherry tomatoes and you’ve got a side. If you want to add a little starch, go for rice pilaf or scalloped sweet potatoes. Once the sides are ready and the chops have been seared, plate them with a drizzle of Jim Quessenberry’s Sauce Beautiful White* over the chops with a spritzer of lemon juice over the entire plate. Serve and enjoy. *Jim Quessenberry Sauce Beautiful White is not affiliated with Reid Martin’s Sauce Gorgeous El Blanco. Oh by the way, the revolutionary method is to allow the meat to rest between cook times. This may not be obvious, but when you do it right and realize how good it all turned out, you’ll see what I mean. In a fast paced world, sometimes you have to savor the flavor to enjoy things. Lots of things have happened lately in our little part of the world of barbecue, but it’s been such a busy day that I haven’t had time to tell you all a story. Instead, I have challenged myself to think of as many slang, jargon, and technical terms about barbecue so that you can have a laugh or become more knowledgeable or both. Texas Crutch – This is a technique where simply wrapping the entire cut of meat, whether pork or beef, in aluminum foil to speed up the cook time and tenderize the meat. It allows very little moisture to escape and significantly decreases the time it takes to reach a desired internal temerature. Some frown upon it, but we use it in many different cases for a variety of simple and effective reasons. Indirect Heat – Cooking a piece of meat that is offset from the heat of the grill or firebox. The heat is transferred through convection to the meat for a slow and juicy cook. When mixed with smoking techniques you get a juicy and delightfully smoky flavor. Direct Heat – Just like it sounds. Steaks, burgers, and pork chops are mostly cooked on a hit grill or surface directly over the source of heat. Think conductive heat. Cold Smoking – It’s not quite what it sounds, but cold smoking is when you cook meat slowly, and I mean s-l-o-w-l-y over a reduced amount of heat. Think of a smokehouse that makes smoked jerky. The cooking is done at temperatures often in the 100-200 degree range and over several hours to days. It’s a unique and traditional form of cooking where meat is often hung up in closet sized sheds and smoke is flowed through the chamber from a very indirect heat source. Temps – Slang for checking the temperatures of both the meat and your smoker or grill. Whole Hog – Literally a whole pig that is roasted over a fire or indirect heat. Babyback Ribs – Ribs from the back near the loin of a pig. Spare Ribs – Ribs from the bottom or stomach area of the pig. Marinading the Chef – Drinking beer, booze, or spirits while you wait on a large cut of meat to cook. Dry Ribs – Ribs that are often associated with Tennessee characterized by an abundance of chili powder, paprika, red pepper, or other spices to form a dry texture on the surface of the ribs. Traditionally served without barbecue sauce on them. Wet Ribs – Ribs served with an abundance of barbecue sauce slathered onto the surface of the ribs. Well Done Steak – To plead with the chef or grillmaster requesting that you’d like to be punched directly in the face for being a giant moron with terrible taste. Turbinado Sugar – Raw sugar from the cane. Red, White, and Black – A commonly used rub recipe consisting of chili powder, salt, and black pepper. White Sauce – Something Big something Gibson something something Alabama tradition… We sell our own. You can buy it here. Table Sauce – A sauce like Heinz 57, A1, Worcestershire, etc. Serving Sauce – A sauce you would serve your BBQ dish with or prepare the dish with near the end of the cook or just after when you’re ready to serve. Could be considered a finishing sauce. Thermometer – A fancy heat measuring device that nearly always goes missing. Hickory – God’s gift to mankind so fire would have purpose. Gas Grill – Something you take to a metal recycling facility for pocket change. Have any others you’d like to add? Send us a comment below.